Fruit and vegetables are an excellent source of vitamins, minerals, fiber and water and play an important role in promoting good health. You should aim to have plenty every day. Juicing can form part of a well-balanced diet but it is important to include it alongside the other main food groups (bread/cereals, meat/meat alternatives and milk/milk products). Sometimes, people take juicing to the extreme and go on juice cleansing diets for days at a time. 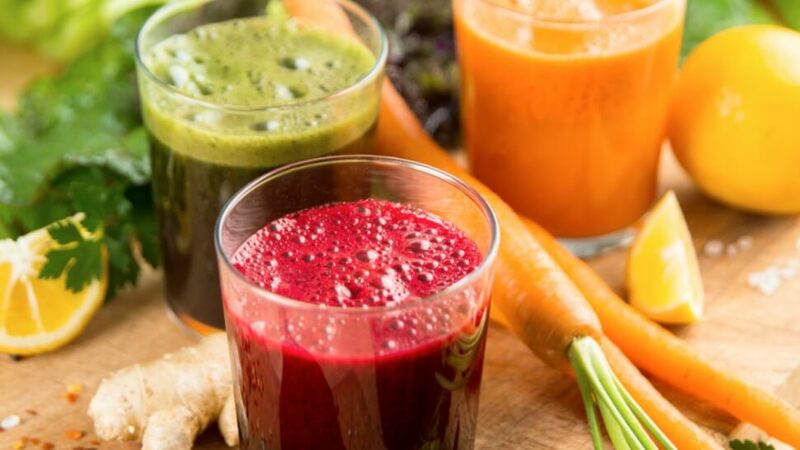 Some popular myths about juice cleansing are challenged below. You have such a clever body that it can detox itself! Your liver and your kidneys are designed to remove any toxins present in the body by acting as filters and packaging up any toxins for easy disposal. On the contrary, if you are only drinking juices and not eating, you may not be getting enough energy to run your body. This will mean you start to burn up your energy stores – a good thing you may think if you’re wanting to drop a few pounds but this is not the way to do it. Once you start to burn your energy stores, you will start to feel light-headed, shaky and may get some nasty headaches. On top of this, lack of fiber in the juices can also cause constipation which can make you feel very sluggish, the exact opposite of energetic. Your body stores energy as glycogen in your liver and muscles, along with water. As these energy stores are used up you lose muscle mass and the water too. This does lead to quick weight loss, but this is definitely not a great way to lose weight. It is not sustainable and can return very quickly once you start eating food again. You are far better managing your weight through exercise and smaller portions of a balanced diet. I’m sure we can all think of many glamorous celebrities who look amazing who say they do juicing detoxes for their good health. But think about their lifestyle and how they often have to rely on a quick fix to lose weight for a highly publicized event. They also look the way they do because they have highly paid stylists and stylized images in magazines. For those of us in the ‘real world’, we need to eat well and exercise in and around our work and family schedules. You are better to eat a healthy, balanced diet for good long-term health.